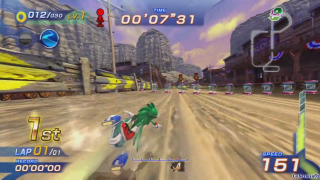 Rocky Ridge is the second racecourse in Sonic Free Riders. It is based on a mining town set in a dry area, featuring mining tunnels, train tracks and minecarts, along with some cacti throughout the course. At one point in the course, the player must use a mining cart to get through an area of the level. This page was last edited on 5 May 2018, at 14:11.